Very recently, we were asked to produce some unique clothes hangers for a very special client. While the England Squad are busy packing their bags ready to head to Kiev for the FIFA World Cup in Russia, their associates were hurriedly preparing everything they’d need to present a professional image at this world class event. 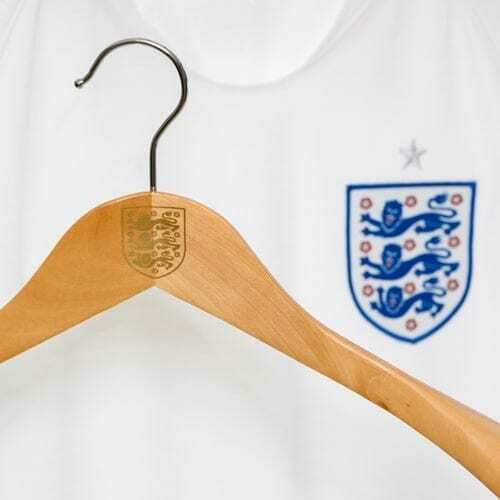 For the ultimate finishing touch, The Football Association had decided to supply each player with custom England Football Team hangers, printed with the classic Three Lions England logo, and came to us for help. 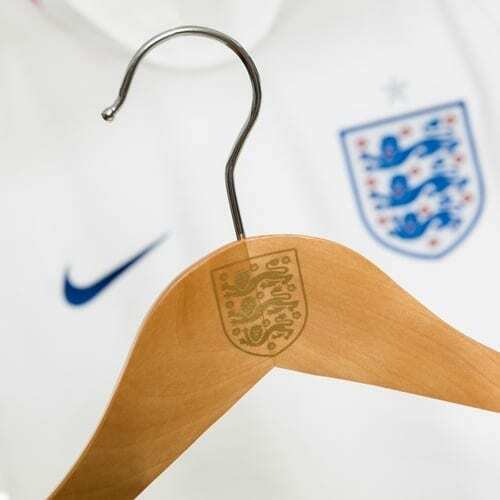 We were asked by the FA to produce a number of hangers for the England Squad, in a natural wood colour with the England crest in gold. 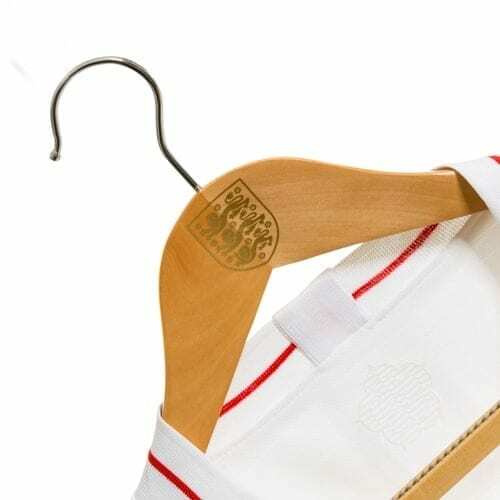 They had decided on suit hangers, so they would be flexible enough to hold robes, dinner suits and other items as required, and needed them produced very quickly in order to be included with the rest of the England Football Team freight which was heading out to Kiev in a matter of days. We recommended a Broad Shaped Wooden Hanger as the base model, as this is a strong, durable hanger suitable for housing a wide variety of apparel. 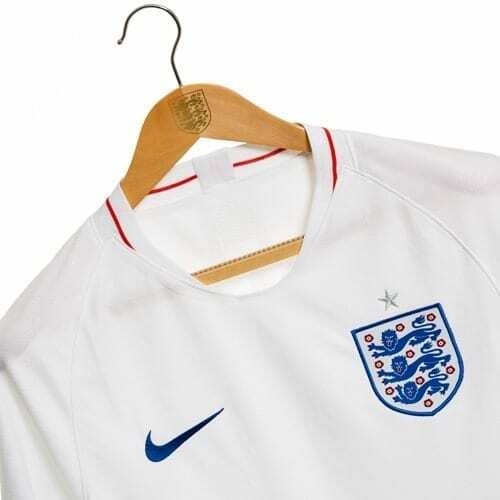 The non-slip centre bar is ideal for storing trousers without worry of creasing, and the flat head would provide the perfect surface for the application of the England Crest in their chosen golden hue. 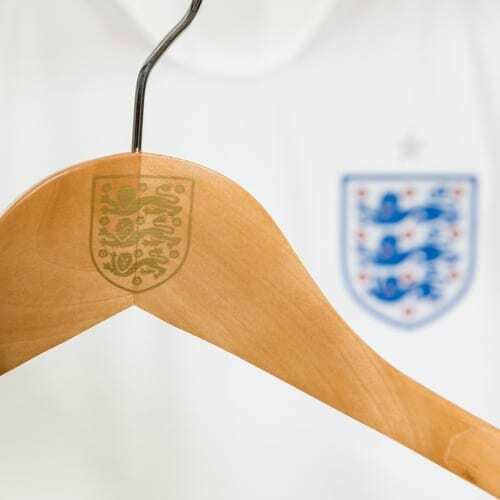 We think you’ll agree that these custom printed hangers for the FA look simply amazing. 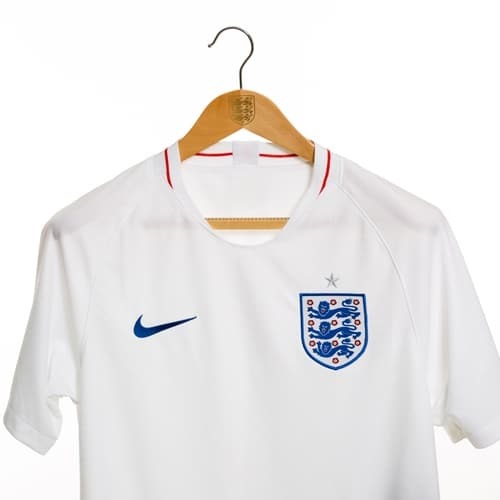 The eye catching Three Lions England logo is resplendent in shimmering gold, and we’re thrilled to have delivered everything in good time to get it shipped to the player’s hotel. 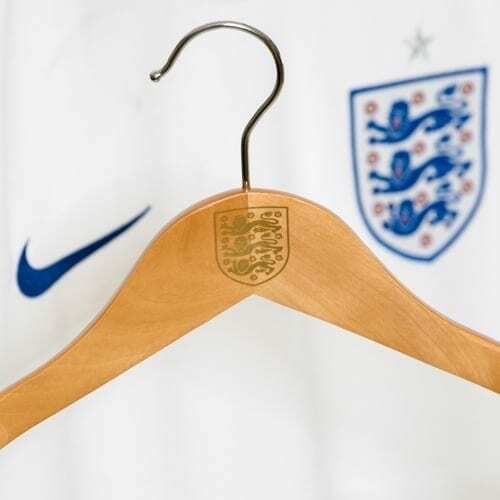 By the time the England Squad arrive in their hotel, at the headquarters of the FIFA World Cup Russia 2018, our hangers will be ready and waiting in their rooms to give them a boost as they settle in for the competition. Although getting such a big order on a short deadline is always challenging, as usual Valentino’s rose to the challenge. 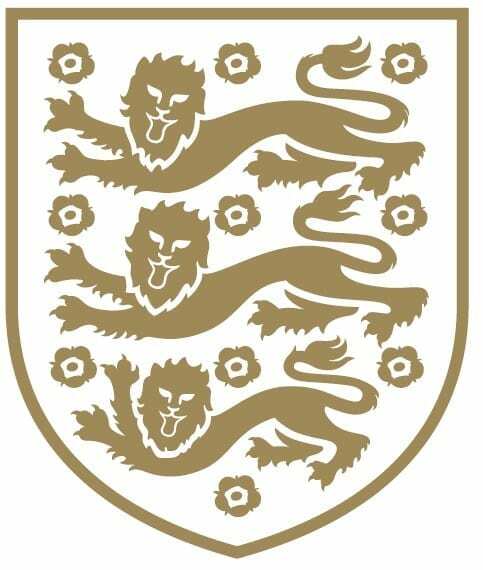 We hope that the England football team will rise to the challenge of the World Cup 2018 too, and that they bring home a great result for us and for our valued clients at the Football Association. If you’re interested in having some amazing custom printed hangers produced for your business, club or special event, simply get in touch with the experts at Valentino’s and we’ll be happy to help. While visual merchandising is a critical aspect of attracting customers to buy your products, retailers often forget how important the packaging of the product itself is. Product packaging is a crucial marketing tool and can be the convincing factor that makes your customers buy. When you are thinking of how to make your products more attractive, product packaging may be more important than you may think. While it may be up to the manufacturer to package products, and not you as a retailer, having well-packaged products will show your store in the best possible light. As a retailer, you should make sure that you present your products beautifully. Product packaging should be clean, free of dust and in good condition. If product packaging is damaged or scruffy, then you may be putting off your customers from purchasing. If you sell products exclusively, then branded packaging may be the key to your success. Branded packaging can be instantly recognisable which will be an immediate draw for customers. If you have exclusive items or sell a specific brand which is popular with your customers, then try to theme your point of sale areas with the same packaging colours and use it as a marketing tool. You may be able to ask manufacturers for their own point of sale displays to further improve your marketing. If you sell delicate or fragile items, then it may be your responsibility to package items accordingly after the sale. How you sell and deliver your products to customer is a sign of quality customer service and is not an area where you will want to fall short. 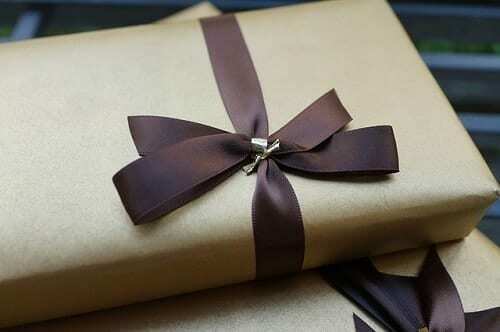 Consider packaging such as bubble wrap, wrapping paper and tissue paper. As well as this, you should consider carrier bags. After all, the presentation is everything. 87% of UK citizens shop online. With this in mind, having an e-commerce store and well as a physical shop can be an excellent way to boost sales and improve your bottom line. However, online sales are only worthwhile if you make sure the product arrives in good condition to minimise the chance of returns and refunds. Product packaging is vital to protect your goods and make sure that they arrive at the customer in pristine condition. How you package products can be just as influential as how you display products. The colours you use in product packaging and the type of packaging used can significantly influence a customer’s buying decision. When you are researching for products to sell, it is essential to check their packaging as well as the product. The product packaging needs to align with your brand, and it is not worth having a great product if the packaging looks poor. When selecting your products to sell, make sure to check the packaging so that it aligns with your shop and will be successful. To make sure you deliver products, with care and style, the packaging is essential. At Valentino’s Displays, we stock a range of product packaging to make your products stand out for all the right reasons. Where you pack items for customers or send products through online shopping, we have the packaging to help. Browse our collection now or contact the team to find out more. The Visual Merchandising and Display Awards are an important retail award ceremony that celebrates one of the most critical aspects of shops that can help to increase sales. Taking place annually, the event celebrates excellence, innovation and originality for creatives, retailers and suppliers. Any retailer or visual merchandising team can take part in the award ceremony as they are entirely free to enter and there are over twenty categories to pitch for. The awards celebrate both independent, individual and small shops as well as the larger multiple retail outlets. If you are considering entering for 2018, here are some top tips from the winners of the Visual Merchandising and Display Awards from 2017. Props can be an excellent way to get people talking about your display and can be as big and dramatic as you want. With props, you can create an incredibly creative design and tie in your products in a way that suits you. Props may simply be used as a platform to display products. The winner for the most outstanding feature in the VM and Display Awards 2017 was the retail fashion store, Missguided. For their entry, they used a bright pink Jeep, with their mannequins showing their clothing range set up around the vehicle. While the Jeep had no link to the clothes, it was a way to inspire a road trip wardrobe as well as being a remarkable feature in the middle of the store that certainly attracted attention. 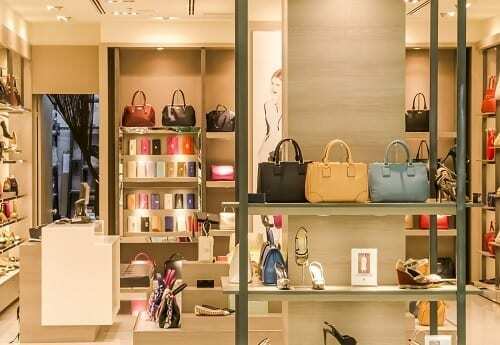 If you use mannequins to display products, then you could be missing an excellent visual merchandising trick. Have you ever thought about bringing your mannequins to life? Mannequins do not simply have to stand there; they can be in the heart of the action. For example, your mannequin could be taking your mannequin dog for a walk? The winner of the VM and Display Awards for 2017, Hackett, had their mannequin performing a skydive landing into the water. At Valentino’s Display, we offer a range of flexible mannequins as well as action mannequins so that your display dummies have character and life. With this, your customers can see how products can be a part of their life, not just a great display. Christmas window displays are almost as important as Christmas adverts on the television. Seasonal events are an excellent opportunity for you to wow passers-by and make sure people are mesmerised by your store. Festivities give you the artistic licence to pull out all the stops and go big and bold with your design. Unsurprisingly, John Lewis were the winners of the Christmas Display Award in the VM and Display Awards for 2017 with their underground woodland cave window featuring cosy snugs that brought the true essence of winter and Christmas, without a Santa Claus in sight. Want to enter this year’s awards? At Valentino’s Displays, we have a vast range of visual merchandising and display products to help you create the perfect window and in-store display. If you have an idea but need some help turning it into reality, our display equipment can help. Browse our extensive collection here and don’t hesitate to call on 01489 808007 for friendly advice. We look forward to seeing your entry! This season it’s all about creating something remarkable, something that stops passers by in their tracks. When it comes to your window display for Spring/Summer, think theatrical, think magical and don’t hold back. Create drama with different materials, layers and levels. Use backdrops and accessories to create a scene around your products, tell a story and make your products the star of the show. 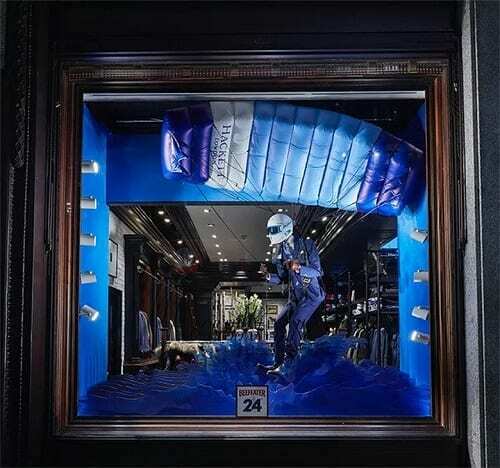 Interactive window displays are on the rise, with video, sound and cameras all being incorporated into the traditional window display. Encourage your customers to stop and become part of your display, with a selfie camera or a video screen to ensure that they engage with your products. Try a simple display using stands at varying heights to create interest, coloured lighting and three video screens that showcase your product and the lifestyle that surrounds it. The ‘green’ trend has taken over a variety of industries. It’s not just beauty brands that are becoming green – the everyday modern day consumer is becoming more and more conscious of the environment and their purchasing decisions. Tap into this market by creating a display using recycled materials, today you can create visually impressive displays using recycled materials alone. Communicate to passers by with a bold and bright sign. Today our world is so visual. As consumers we like to understand how we fit in with something, how something might look on us, and how a product might be right for us. Because of this, there is a big demand for life-like mannequins, as displaying products on realistic models has been shown to encourage people to buy. Tap into this trend and create a life-like scene in your shop window. Tell a story and use that story to enhance your products. Try our collection of life-like mannequins and build your display from here. Greenery is back big time, with brands in all industries using plant styling to enhance their product photography and window displays. Breathe life into your window display and make your products come to life by styling with greenery. Try large floor standing plants, hanging plants on stands and from the ceiling, weaving in and behind your products to create a vibrant and eye-catching display. 2018 presents the perfect opportunity to get creative with window displays and think outside the box. If you’re looking for accessories, stands, mannequins and more to create your eye-catching window display this year, we’ve got you covered.